All of our Apollo Ice's trucks are 'over speck'ed', meaning we build our trucks beyond what the industry recommends. All trucks are GPS tracked, have more insulation, and bigger refrigeration units than the industry standards. A quality bag of ice in a timely manner is why we 'over speck' our trucks. 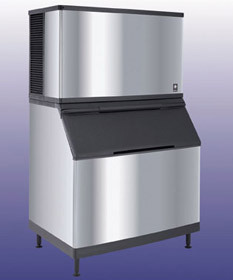 Apollo Ice provides quality merchandisers (freezers) to for your business. Whether your need an inside or outside freezer we have you covered! Note - customers must meet minimum volume standards to retain freezers. Are you in the foodservices industry? Has your ice machine broken down? Are you having a party and need ice for it? Then our special/emergency delivery is for you. Starting at a minimum of 800 lbs we make special deliveries around the beltway generally within two hours. What separates Apollo Ice from other ice companies? Our people- plain and simple. Good folks, who work hard and take pride in a job well done.